TOP 20 FINALISTS for 2018 Miss Soweto finals have been confirmed. 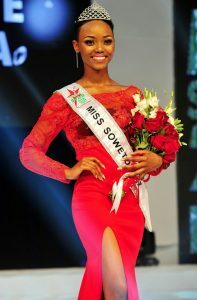 2017 Busisiwe Mmotla, (Emdeni-Soweto) will hand over the crown to a new Miss Soweto, on December 1. Teacher Busisiwe Mmotla, (Emdeni-Soweto) who was crowned Miss Soweto for 2017 will hand over the crown jewel at the 2018 winner finals to be held at Soweto Theatre (Jabulani), December 1. This years’ winner pockets cool prizes worth over R250 000. “We are so pleased with the calibre of the entrants we received for Miss Soweto 2018. All the finalists displayed confidence and intelligence. We invite the community to join us and show their support for these amazing young ladies, as well as to be a part of the excitement of crowning Soweto’s new queen,” says White Star Marketing Manager, Mokhele Makhothi. White Star offers the winner of a cash prize of R100, 000 and will be appointed her as its brand ambassador. Other partners supporting this year’s pageant include Clinix Health Group, Even & Lovely and Educor. Tickets details and programme for the evening will be made available soon.